Next one in our list of best electric pressure washer is Earthwise PW18503 1850 PSI 1.5 GPM Electric Pressure Washer. Its 13 Amp motor can generate up to 1850 psi and can puts out about 1.3 gallons of water/minute. Its a very versatile machine and comes with 25 foot reinforced hose and 35 foot power cord, so that you get maximum range and also be able to reach hard to reach areas. 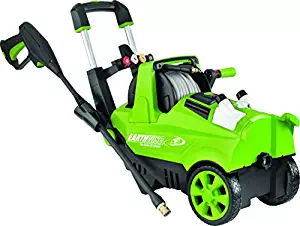 It also comes with horizontal operation and four quick connect spray tips, a built-in soap tank, hose storage reel and aluminum hose quick connect. The telescopic 3 position foldable handle and wheels are designed so that you get the best maneuverability and is very balanced and also very easy to store. 13 amp motor generates up to 21850 PSI 1.5 GPM. 25 foot flexible fiber reinforced hose. 35 foot power cord with GFCI plug. 3-position foldable handle and wheels.